Aaron R. Fahrenkrog, Esq., and John K. Harting, Esq. This discussion explores the unique considerations related to calculating damages in misappropriation of trade secrets cases. This discussion includes an analysis of plaintiff’s damages remedies in trade secret cases, including plaintiff’s actual loss, defendant’s unjust enrichment, valuation of trade secrets, and reasonable royalty, and defendant’s rebuttal strategies for reducing and/or eliminating plaintiff’s damages. It is important that the analyst link the damages to the alleged misappropriated trade secret(s) and tie the damages remedies to the specific facts and circumstances of the case. Damages analysts are often asked to estimate a reasonable royalty rate to measure economic damages for purposes of trademark and patent infringement. Although the bodies of law related to trademark and patent infringement are different from one another, the principles and concepts used to estimate a reasonable royalty rate for these types of intellectual property are fairly similar. This discussion summarizes the methods and procedures that analysts use to estimate a reasonable royalty rate. And, this discussion describes the factors and circumstances that analysts should consider when selecting a reasonable royalty rate for trademark and patent infringement purposes. Finally, this discussion focuses on the comparable uncontrolled transaction method, a commonly used method for selecting a reasonable royalty rate. The doctrine of laches remains alive and relatively well in patent litigation, and this is good news for alleged infringers. Patent owners and alleged infringers alike should continue to take seriously the potential impact of a viable laches defense. Why? Because a finding of laches can eviscerate or eliminate entirely the types and scope of monetary relief (e.g., past monetary damages) and, in certain cases, equitable relief sought by a patent owner who files an otherwise-winning patent-infringement action but who unreasonably and inexcusably delays filing suit. 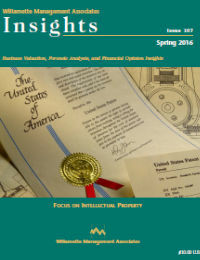 This discussion includes an analysis of recent trademark infringement cases and current trends affecting the recovery of attorneys’ fees in trademark infringement matters, including the Supreme Court’s definition of “exceptional” and the impact of the Octane Fitness patent infringement decision on trademark infringement matters. Mark Stingley, Esq., Morgan T. McCreary, Esq., and Michelle M. Masoner, Esq. Our Circuits are divided on whether a debtor-in-possession can assume the intellectual property license that the debtor company was using under a license before the Chapter 11 case was filed. Some Circuits employ the “hypothetical test” and some Circuits apply the “actual test.” These two diametrically opposed tests make the results about whether an intellectual property license can be assumed dependent upon where the case is filed. This discussion explores these tests and the American Bankruptcy Institute Chapter 11 Reform Commission recommendation on the subject. As intellectual property (IP) assets continue to increase in value and importance to more companies, the need to protect those IP assets increases. Many look to insurance as part of the solution to help manage the risks associated with claims of IP infringement. The marketplace offers various risk transfer solutions that warrant consideration as part of any entity’s risk management strategy. Licensing Analytics Insights In January 2007, the Supreme Court handed down a decision in Medimmune v. Genentech, holding that a licensee did not have to terminate or breach a license agreement to have standing to bring a declaratory judgment action that a licensed patent is invalid.1 In the aftermath of this decision, licensors began including a variety of agreement provisions intended to discourage licensees from challenging the validity of a licensed patent. However, the effectiveness of these provisions, particularly those that prohibit a licensee from ever challenging the validity of a licensed patent, continues to be an issue. In the wake of what some commentators have described as an “anti-patent” tendency of the courts,2 what can a licensor do to avoid having to litigate the validity of a licensed patent with its licensee? Licenses are becoming an increasingly common means for intellectual property owners to reap some benefit from their inventions without having to manufacture a product or employ a process themselves. Therefore, the royalty audit is an important tool for licensors who want to successfully manage their intellectual property. This procedure serves to ensure that the licensor receives the agreed upon level of benefits (in the form of royalty payments) as outlined in the licensing agreement. Licensing agreements can be inherently complex contracts. Further, evidence from royalty audits shows that licensees perform very poorly in self-reporting royalties. When the potential for litigation or disputes over royalty amounts is possible, the royalty audit should be conducted by a forensic analyst who is experienced in reviewing and analyzing complex financial information. Methods for Valuing Customer Relationships: Use of the Multi-Period Excess Earnings Method or the Distributor Method? Forensic Analysis Insights The income approach is a common approach used in the valuation of customer-related intangible assets. Within the income approach, the multi-period excess earnings method is a common method to value customer relationships. In recent years, valuation analysts have used the distributor method, also an income-based approach, as an alternative method to valuing the customer relationship intangible asset. This discussion describes the two valuation methods and provides guidance on the appropriate use of each method. Trade secrets constitute an important component of many companies’ intellectual property portfolio, and trade secrets are an integral driver of economic growth. Yet there is a surprising lack of empirical research related to the valuation of trade secrets. The collection of U.S. civil case law pertaining to damages awarded for misappropriation of trade secrets offers a potentially rich area of study. This discussion presents a quantitative analysis of damages for trade secrets misappropriation in civil litigation. This damages analysis may also provide insights into the trade secrets valuation.